Grille 29 offers upscale casual dining in Huntsville's Village of Providence. The steakhouse is known for its seafood and desserts. 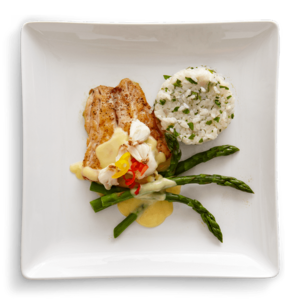 Pan-seared and topped with jumbo lump crabmeat, asparagus and hollandaise, this dish is worthy of all the raves it receives. In reviews, customers repeatedly say the fish is "amazing," and the accompanying white-corn cheese grits give it a Southern flair while maintaining the quality of fine dining. Customers say the grits are creamy and delicious — a must-have. Aside from seafood and steak, Grille 29 has desserts to die for, including Chocolate Peanut Butter Truffle and Tiramisu Tower.